In 1938, with the Japanese army approaching from Nanking, Huan Hsu's great-great grandfather, Liu, and his five granddaughters, were forced to flee their hometown on the banks of the Yangtze River. But before they left a hole was dug as deep as a man, and as wide as a bedroom, in which was stowed the family heirlooms. The longer I looked at that red chrysanthemum plate, the more I wanted to touch it, feel its weight, and run my fingers over its edge, which, like its country's - and my family's - history, was anything but smooth. 1938. The Japanese army were fast approaching Xingang, the Yangtze River hometown of Huan Hsu's great-great-grandfather, Liu. Along with his five granddaughters, Liu prepares to flee. Before they leave, they dig a hole and fill it to the brim with family heirlooms. Amongst their antique furniture, jade and scrolls, was Liu's vast collection of prized antique porcelain. A decades-long flight across war-torn China splintered the family over thousands of miles. Grandfather Liu's treasure remained buried along with a time that no one wished to speak of. And no one returned to find it - until now. Huan Hsu, a journalist raised in America and armed only with curiosity, returned to China many years later. 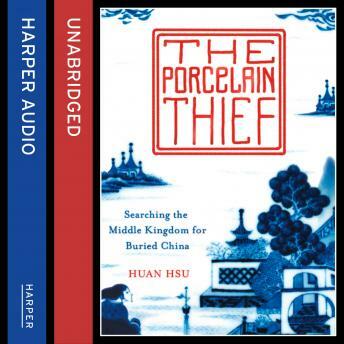 Wanting to learn more about not only his lost ancestral heirlooms but also porcelain itself, Hsu set out to separate the layers of fact and fiction that have obscured both China and his heritage and finally completed his family's long march back home. Melding memoir and travelogue with social and political history, The Porcelain Thief is an intimate and unforgettable way to understand the bloody, tragic and largely forgotten events that defined Chinese history in the nineteenth and twentieth centuries.